Among the underlying causes are poorly trained teachers, inadequate funding, overcrowded classrooms and the lack of textbooks and other instructional materials. In short, the usual suspects. But if this were always the case, why do some schools and students do well even if they face the same constraints? Corruption: If a bigger budget is allotted for public schools, how can we be sure that the money will go where it's supposed to go? See "At DepEd, A Cleanup at the Top but Corruption in Field Offices" by Yvonne Chua (PCIJ, 9-10 June 2003). Lack of political will: The recent resignation of the chair of the Commission on Higher Education highlights the don't-walk-the-talk policy currently in place. Leadership on the lower levels cannot exist without leadership at the highest level. See "Editorial: Higher-education lows" (Philippine Daily Inquirer, 15 May 2005). In the final analysis, there really is just one solution: an effective leader who will not tolerate corruption and who will exercise the necessary political will to do "What needs to be done." Note: Today is the beginning of the "Flag Days," which, according to Section 26 of Republic Act 8491, are held "from May 28 to June 12 of each year... during which period all offices, agencies and instrumentalities of government, business establishments, institutions of learning and private homes are enjoined to display the flag." The Official Website of Joseph Ejercito Estrada was in the news recently. While it has its own value in terms of presenting a particular president's view of his presidency, it will not be the best source for objective views on what he was (not) able to accomplish. In elementary schools, there is no allocation for a librarian. In the secondary level, supposedly there should be one librarian for every 1,000 students in a school. Donated books and materials may be available, but there's no professional staff to man the library. There are purportedly satellite learning resource centers, but more often, they are poorly equipped, not functional, and good only during evaluation periods. The excerpt from the letter to the editor quoted above is correct—but not entirely. According to a little-known DECS Order (No. 6, signed by Ricardo Gloria on 22 January 1998) entitled "Policies and Programs for School Library Development," there should be one teacher-librarian for every school with a student population of 500 or less, one full-time and one part-time teacher-librarian for those with 501-2,000, and an additional full-time librarian for every 1,000 students for those that have more than 2,000 students (see Page 3). The same DECS Order also states that "Library funds shall be 5-10% of the school funds" (see Page 5). Unfortunately, the DECS Order cannot be enforced because a law—and not just an order from a long-gone department secretary—is needed to appropriate funds automatically in public schools in the Philippines. If you would like to help public school libraries in the Philippines, forward this post to your congressman (so that a bill can be drafted allocating funds for libraries) or the higher-ups at the Department of Education (so they can review the order and issue an updated one). It all started with an email from Clair, who learned about it from Ramil's "Filipina," who got the idea from Ergoe's "Result-Oriented," who picked it up from Milky Soft's "Filipina and the Philippines," the one that started it all. Blah! 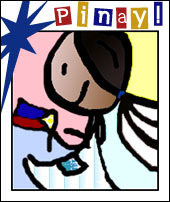 : "Google for the word “Filipina” and see what turns up" and "Thoughts on being a Filipina"
Iblog: "The Google Zeitgeist on 'Filipina'"
W3O: "What is a Filipina?" To the Tale: "Stereotypically Speaking..."
Sassy Lawyer: "What is a Filipina?" Jardine Davies' Every Other Rambling: "Google Keyword: Filipina"
Information Narcosis: "The Truth About the Filipina"
Snarkmarket: "Electronic Wars of Self-Representation"
Global Voices Online: "Thursday World Blog Roundup"
Teacher Sol: "I am a Filipina teacher" and "Yan ang Pinay"
Beth's Blog: "Google Bombing Campaign: Filipina"
The Ignatian Perspective: "Using 'Filipina' Not A Dilemma"
I have also written "The Filipina in Cyberspace," "Images of the Filipina Online," and "Sacha Chua: Filipina." So why am I doing all of this? I owe a lot to Filipinas, especially Filipina librarians, and my mom! Can our youth still identify with a tune that is over a century old? Or do we reinvent or repackage that same tune to make our youth sit up, rap, or dance, as they revisit the past? ...Nobody seems to care that the Flag Code prescribes that the anthem be sung the way Julian Felipe composed it in 1898. Is this possible? It seems that he would like to update the National Anthem but is constrained by Section 37 of Republic Act 8491 ("The rendition of the National Anthem, whether played or sung, shall be in accordance with the musical arrangement and composition of Julian Felipe") to keep it as it is. To echo his question, is it possible to update the National Anthem and still retain its patriotic feel? My answer: not only possible, but necessary. We do not speak now the way Filipinos spoke during the time of the Philippine Revolution. And we should not be expected to sing the way they sang. This is not a joke. There is, in fact, a book in the Library of Congress with this subject heading. Beth Dunning, in "Newsflash! Subject Headings not boring!" (Marginal Librarian 12:2), suggests that "someone at the Library of Congress has a sense of humour, and is taking advantage of the fact that no one is watching." But in this particular case, the subject heading may be argued to have been correctly assigned because the book is a collection of papers read at a conference on drilling and rock mechanics. Check out the article for more hilarious subject headings. And if you have any of your own (preferably available through an online catalog), please share them by clicking on "Add a comment" below. You need a master's degree to be a librarian? There's a licensure exam for librarians? What will you do with your degree and license? Aside from picking up some shiny new tips and information snippets on blogging, I met a few fellow bloggers... there was the guy with the intriguingly named Filipino Librarian blog. rei: Intriguing because I've always wanted to be a librarian. I've always thought the work holds a certain mystique - imagine being around all those books! vonjobi: ha! one more reason to be happy that i went to the summit. i usually get blank stares when i tell people that i'm a librarian. could it be that bloggers tend to [be] book lovers? The problem is worse. Check out Google Images and Yahoo! Images. Google analyzes the text on the page adjacent to the image, the image caption and dozens of other factors to determine the image content. Google also uses sophisticated algorithms to remove duplicates and ensure that the highest quality images are presented first in your results. Yahoo!, on the other hand, seems to rely on the presence of the word "Filipina" in file names (e.g., filipina.jpg) and URLs (e.g., www.filipina.com) to come up with its results. An email from Clair (via Digital Mercenary, Ergoe, and Milky Soft) alerted me to the fact that when the term "Filipina" is Googled, the top hits are mostly for mail-order brides. Consider this my humble contribution to the campaign to restore the Filipina's dignity online. In "Meta Search," I wrote that not all search engines are created equal. And so, while Google is important, we might as well see what comes up on other search engines for the term "Filipina." Jux2 limits its searches to the top three search engines (e.g., Google, Yahoo, Ask Jeeves), while Ixquick looks at just about all the other search engines except Google. "Philippine Heroines of the Revolution: Maria Clara they were not"
"Not Just the Maid: Negotiating Filipina Identity in Italy"
And finally, just to show that not all websites about Filipina brides are owned by male chauvinists, check out www.asawa.org. There are, in fact, more than just a few good men who care about women. Check out the website of La Visa Loca. If the movie is as funny—and painfully real—as its website, then watching it should be hilariously heartbreaking. To understand what I mean, make sure you enter a good reason for applying for a visa in the space provided. A recent article on Filipinos immigrating to Canada, "More Filipinos brave Canada’s cold climate to seek better future" by Mynardo Macaraig (Manila Times, 14 May 2005), reveals some of the reasons many Filipinos desire to leave the Philippines. This blog is three months old today. "Leadership skills in the library" in Blah! What do you not like about this blog? What would you like to read more about in this blog? What would you like to read less about in this blog? The Socio Economic Research Portal for the Philippines is "an online electronic database of... research studies related to economic development and policymaking." Studies in the form of monographs, journal articles, etc., from the Philippine Institute for Development Studies constitute a big part of the collection (note: the statistics don't seem to add up to the total). Reports, theses, etc., from 24 other institutions may also be accessed. Many of the publications are available in full text (pdf). Once you've found the publication you wish to view or download, click on the "call number" across "Available Publications" (see image below). School Library Journal now has a blog. Check out the The SLJ Virtual Summit, "an online portal for education's various stakeholders to sustain the important dialogue and strategic recommendations that characterized School Library Journal's First Annual Leadership Summit held in March." Politicians and bureaucrats have already destroyed basic education—that is obvious in the annual litany of class-opening problems, such as the lack of teachers, classrooms and books, which provide petty politicos and greedy bureaucrats with the alibi to dip into the public coffers and spend resources, leaving them enough room for kickbacks. The lack of teachers, classrooms and books is a perennial problem in the public education system. This is the reality that public school librarians face. If there is no money for the basics of basic education, how can we then expect the government to have money for libraries? But should librarians just give up? The answer lies not with politicians, principals, teachers, or parents. The answer lies with the librarians themselves. Our "Lupang Hinirang" sings of peace, the beauty of our hills and seas and the azure skies, and the treasured liberty we will defend with our very lives. We should all rise to hear those gallant words. Independence Day is less than a month away. But the disrespect of the national anthem that Cruz writes about is not a welcome display of independence on the part of citizens and non-citizens who should know better. See Wikipedia for more on the history of the national anthem (sometimes incorrectly identified as "Bayang Magiliw"), its lyrics in Tagalog, Cebuano, English, and Spanish, and links to websites with downloadable versions of the song. It's good to know that publishers are also involved in the preparations for Consal XIII. ...this early, they are already laying the groundwork for the Congress of Southeast Asian Libraries which Manila will host next year. The congress is held every two years. The article refers to the Congress of Southeast Asian Libraries instead of Librarians. But, hey, it's better than nothing. There is more to search engines than just typing words into the search box. The Google Help: Cheat Sheet has some tips that can help you narrow down what you're looking for. If, for example, we were to use the words pacific plans in our search, we would get more than 15,000,000 hits. The first result would be the Pacific Plans website. But what if you want to find out what other people are saying about Pacific Plans and don't want to go through US Plans for the South Pacific during World War II? Putting quotation marks around "pacific plans" will lead to more than 7,000 hits. Much better but you still get results for companies like Air Pacific, Cathay Pacific and Union Pacific, whose names tend to be followed by the word plans in news stories. Clicking on the option for "pages from Philippines" (note: this is available only if you're using Google Philippines) will reduce the hits to about 500 and eliminate results like those mentioned above. If you're not really interested in the more formal results, try adding -inc (meaning NOT those that have the word inc, e.g., Pacific Plans, Inc.) and hits will go down further to around 100. But if you're really just looking for the blog run by disenfranchised planholders of Pacific Plans, just add the word blog to "pacific plans" and you get about 30 hits. But wait, blogs pointing to the website you're looking for are shown but not Pacific Plans - Broken Dreams. What's going on? Could it be that there's a conspiracy to prevent those looking for the blog from finding it?! Calm down. It's very likely that the blog's owners just forgot to indicate "Philippines" as their location in their user profile. And that's why the blog doesn't show up: because you're looking only for "pages from Philippines." But it does show up as the fifth hit (along with about 200 others) if you click on "the web." use "quotation marks" when you're looking for a "specific phrase,"
check out the Google Help: Cheat Sheet for more tips. ...the best library leaders I’ve known have loved their jobs and people too... To be an effective leader you have to believe in your cause and care about the people you are leading. Are you a leader or a follower? Why do you do what you do? Do you have a vision that you want to achieve? Sometimes, the best way to answer a question is to just point to someone. Whom would you point to? Would you like to follow in your boss's footsteps? Leaders do not necessarily have followers in the beginning. You can be your own leader even if you're all alone in your library. Eventually, if you are successful and people start taking note of what you've done (and believe me, they will not notice how precisely you've cataloged the books, so start focusing on your customers' needs), your circle of influence will expand and "followers" will just come in the form of customers, supporters, donors. Be proactive. Begin with the end in mind. Live what you believe. For more information, see "Business leaders can learn from pope" by Claudio Luffoli (USA Today, 4 April 2005) and the summary of Stephen Covey's The Seven Habits Of Highly Effective People. Click on the image to view the source. 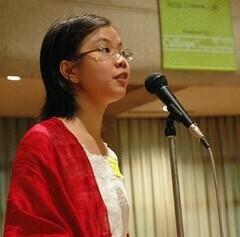 Ang Kiukok, National Artist for Visual Arts (2001), is dead. For more details, see "Visionary National Artist Ang Kiukok dies; 74" by Lito B. Zulueta (Philippine Daily Inquirer, 11 May 2005). Click on the images to view the websites. 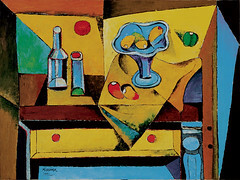 Artsentralmanila.com is a good starting point for information about Filipino paintings. Its Archive (March to October 2004) includes articles on artists, collectors, investing in art, etc. Lists of Galleries, Museums and Artist Websites are also available. Some of the institutions and artists in Artsentralmanila.com's lists have websites that may be used for research. (Note: Not all links are working, notably the one for the Ateneo Art Gallery.) The Lopez Memorial Museum, for instance, has articles about Juan Luna and Felix Hidalgo, as well as some of their paintings. However, websites devoted to individual artists are more useful for those who wish to appreciate an artist's entire body of work. The work of Anita Magsaysay-Ho, for example, is better appreciated when viewed chronologically. Lawyers, writers and journalists were very visible at i blog. I'd like to think that librarians, to a lesser extent, were visible, too. And this presence at a "techie" event, I believe, bodes well for our profession. I'm going to bet that most bloggers who stick with it do so because they are fearless learners. We want to know more, push our thinking, exchange ideas. We have found teachers that inspire us and move us with their own intelligence or creativity or sense of possibility, and they teach us daily. Have you found a librarian to learn from? A librarian blogger? A mentor in library school or in your library? Are we still learning to learn? Are our organizations still learning? I think some folks in libraryland may not be...and that scares me. Amy of KTS Library introduces herself in "Information Specialist. What?" by saying that, "We need to engage the world we are in and the generation that molds it." Mal’akh vows in "Stack Dreams" that, "I will make it a personal project of mine to make a calendar whose models were all librarians." Juned, who has eight blogs, writes in library7 about how his work as an abstractor affected his reading habits. 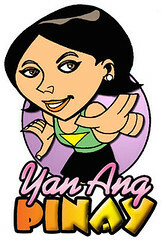 Zarah, School Librarian in Action, writes in The Coffee Goddess, her personal blog, "i just realized, after attending the 1st philippine blogging summit, that i can put links in my blog if i use certain templates. (go ahead, smirk!)" I would rather delve into the technical aspects of being a librarian. I love messing with those things. I love classification, indexing and abstracting. I love looking up potential materials for acquisition. I like not-so people-oriented tasks. And then she asks, "Is there anything wrong with me? I feel so un-librarian-like right now." If there is anything wrong, it is that after confessing that she likes the activities librarians are supposed to like, she states that she feels "un-librarian-like." Well, if you look at her other blog, clair.free.net.ph, you'll see that she is probably the techie-est librarian blogging in the Philippines today. Very "un-librarian-like," indeed! These are just a few—and not all, I'm sure—of the Filipino librarians who have continued learning to learn. Some of the news is good, some of it is bad, but some of it I wish the Philippines had. BAHRAIN: "Book for All scheme a huge success"
CHINA: "Guinness World Record For 'Highest Library In The World'"
INDIA: "Book arson 'a Taleban-style' act"
JAPAN: "National Diet Library working on digitization of books"
MACAO: "Macao's century-old libraries presented on stamps"
SINGAPORE: "National Library highly ranked as most innovative - survey"
TURKEY: "Turkey probes official who ordered novelist’s books destroyed"
TURKMEN: "Turkmen hit by library ban"
VIETNAM: "Vietnamese students avoid inconvenient libraries"
Socorro C. Ramos, the founder of National Bookstore, is probably the closest to a celebrity mom that Filipino librarians will ever have. True, she is not a librarian, but she has made different kinds of books available to many Filipinos. And, perhaps, librarians can learn from her experience: that library users are customers; that if a customer looks for something, make sure you also offer a related item; and that librarians should be sensitive to the needs of their customers. See the in-depth interview with "National treasure Socorro C. Ramos" (Part I and Part II) by the Playtime Staff (Philippine Daily Inquirer, 6 March 2005). "Mothers at center of observance of Mother’s Day" by Brenda Piquero (Manila Bulletin, 8 May 2005) includes a history of the development of the observance of Mother's Day. There is no data on Filipino mothers similar to the U.S. Census Bureau's Facts for Features but the National Statistical Coordination Board does have data on marriages from 1983-2001. But this is not really useful because not all those who get married become mothers, and not all mothers get married. Congratulations to UP Law-ISP for its efficient and effective hosting of i blog! Click on the photos to see the blogs. "If you can't take the heat, get out of the kitchen." Well, it's summer and it's hot, but all I can think of is food. Mouth-watering photos, what to buy where, recipes and others. Check out its Archives for a complete list of all posts and Links for other food blogs. Lutong bahay (home-cooked meal) recipes, photos and more. This is actually the food blog of the sassy lawyer in her other role as a Filipino mom. See "Eating out; take out" if you can't cook (like me!). The following essay is a revised version of the statement I submitted when I applied for the International Travel Award sponsored by ISI Emerging Markets and administered by the Business and Finance Division of the Special Libraries Association (SLA). And yes, I was given the award, so I will be in Toronto, Canada, June 5-8, for the SLA's annual conference, "Putting Knowledge to Work." “We don’t have money” is what many librarians in the Philippines will say to excuse the state of our libraries. But I do not believe that money is the only problem. Many Filipino librarians do not have the leadership and communication skills necessary to persuade their superiors and possible donors—even subordinates—that they can effectively implement the projects for which they ask assistance. The biggest challenge facing librarians in the Philippines is to take off the blinders that prevent us from seeing that money is not the problem; the way we look at the problem is the problem. If we believe that money is the only problem, then the only solution is more money. And since the government, private institutions and universities of a developing country like the Philippines will probably never have enough money to allocate to its libraries, should we just accept that our libraries will never improve? Of course not. The thesis I submitted as a final requirement for my master’s degree in library and information science focused on the factors that influenced the development of public school libraries. In my review of literature, I learned that many studies conducted since 1940 to determine the state of public school libraries in the Philippines examined libraries located in different places and, with minimal differences in methodology, came up with the same results. In fact, while these studies detailed how public school libraries did not meet minimum requirements or fared poorly when compared with private school libraries, the majority had as their most important recommendation—whether first or last—the necessity of having an adequate and regular budget for the library. Findings from studies on public school libraries are not necessarily applicable to all kinds of libraries in the Philippines. But I believe that results will be very similar—even for those with bigger budgets. In my thesis, I compared the two most developed public school libraries. They had similar budgets and populations, but one was more developed than the other. Why? The more developed library had a librarian who enjoyed the confidence of the school principal, district supervisor, and even the mayor. Whereas the librarian in the less developed library—despite having more assistants than the other librarian—could not even get the different subject departments to entrust the collections in their offices to the library. What was the difference? One librarian could speak her customers’ language; the other could not. Many librarians focus on organizing their collections and think that should be enough, they’ve done their job. But the truth is that jobs are never really just about the work—in any profession. The ability to communicate what we do, what we’ve done and what else we can do for our customers is very important. Librarians, especially in developing countries where people are less able to appreciate what they cannot eat, need to sell what they can do for their customers—whether it’s storytelling for children, research methods for students or online resources for busy managers. And the only way this can be done is if we learn to speak the language of our external and internal customers. New librarians need communication skills. In business, if we can’t get others to listen to us, then our ideas are probably not worth considering. Rightly or wrongly, that’s the way the world works. But it’s not just about making ourselves heard either; it’s also necessary to know when—and how—to shout, whisper or keep our mouths shut. Many Filipino librarians just keep quiet, and so their superiors think they have nothing to contribute. And as years pass, these same superiors will cut budgets for their libraries because those in charge are unable to justify the expenses charged to their cost centers. It’s not just the money; it’s the people. Librarians in developing countries need leaders—leaders who can communicate a vision in a language that their internal and external customers can understand, leaders who can inspire confidence in their subordinates and superiors, leaders who will not excuse mediocrity with “We don’t have money.” Unfortunately, library and information science students in the Philippines are rarely—if at all—taught communication skills, much less leadership skills. Please don’t get me wrong. I am not saying that money is not important. What I’m saying is that before we can even talk about money, we need leaders who can communicate what an increased budget for the library can contribute to its parent-institution’s mission. As I discovered through my thesis, two individuals given similar amounts of money will not necessarily achieve similar goals. It is not money that will put knowledge to work. People will put knowledge to work. The biggest challenge facing librarians in the Philippines today is the thought that there is no money to pay for the improvements that we would like to make. With the necessary leadership and communication skills, it is my belief that librarians can and will make a difference—even with the limited amount of money allocated to libraries. 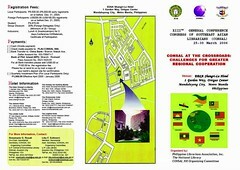 The Congress of Southeast Asian Librarians (CONSAL) will be holding its General Conference in Manila from 25-30 March 2006. The deadline for submission of abstracts has been extended to 31 May 2005. See "Call for papers" (MS Word) for more details. For more information on the conference itself, please click on the images of the flyer below. (Note: A button with arrows will appear on the lower right of the screen. Click on this button to enlarge the image.) 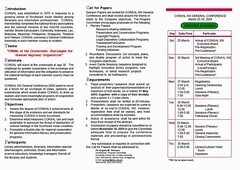 The flyer's pdf version is also available at the conference website. Not all search engines were created equal. Just take a look at the Search Engine Watch Awards and the Pandia Search Engine Awards. Pay close attention to the former's Best Meta Search Engine and the latter's Best Metasearch Site because these allow users to search multiple search engines by inputting their terms just once (Pandia, of course, has its own Powersearch, but Search Engine Watch does not mention it and ethics probably prevented Pandia from nominating its own award-winning site). Try out the winners by clicking on the images on the right. For information on just how much search engine results differ, see "The search engines are more different than people think." It's Labor Day. I was really just going to post about how there is really not much data available online about our profession beyond what is on the website of the Professional Regulation Commission and "The Professionalization of Librarians in the Philippines" by Antonio M. Santos (this pdf article includes the passing rate from 1992 to 2002 in Appendix A). And then I was going to compare and contrast the websites of the U.S. Bureau of Labor Statistics and the Philippines' Bureau of Labor and Employment Statistics—the former has a page devoted to librarians (including what they do, job prospects, salaries, etc. ), while the latter does not. But all this changed when I discovered that a story on LISNews entitled "Philippines have it right: license librarians like CPAs or Lawyers" has sparked a discussion about licensing for librarians in the United States and has, in fact, become the fourth most popular story on LISNews in the past seven days. Let me start with a minor quibble regarding the story's title. It would probably be more grammatically correct to say: "The Philippines has it right" (see The Philippines are or is? and The Philippines). I will now make clarificatory comments on certain statements just to set the record straight and not because I disagree with the statements. They recently amended their laws and require certain specific qualifications before one is allowed to practice librarianship. Republic Act 6966 (pdf) was implemented in 1992, and repealed with the enactment of Republic Act 9246 in 2004. It must be a somewhat hard examination as the Manila Standard newspaper reports that 174 examinees of 599 who wrote the certification exam passed. I was one of the 174 who passed the board exam last year. In the response I delivered when we took our oath, I referred to the fact that "from 1992 to 2003, the passing rate was 50 percent or higher, except for two years: 1992, 36 percent; and 1996, 44 percent. This year the passing rate was 29 percent." The decline in the passing rate was more likely due to the "change in determining examinees’ grades... In previous years, they were using the mean in computing grades." The fact, however, that the two-day exam in Manila took place under less than optimal conditions should not be overlooked. Perhaps they should do that in the States, it would certainly make it quite apparent that it is indeed a "professional" career not simply someone who shelves books. This is, I believe, precisely the reason Filipino librarians lobbied for the enactment of the laws on the practice of librarianship. It is sad but true that prior to 1992, many "librarians" were appointed to their positions solely because their relatives said they were qualified for the position. And since the appointing authorities were the same relatives who vouched for the "librarian," there was nothing anyone could do about it. With the new laws, only licensed librarians can be hired by the government for librarian positions. Accrediting agencies for schools and universities also make it a point to make sure that only licensed librarians are hired by institutions seeking accreditation. Some public and private institutions are able to get around the requirement that their librarian be licensed... but that's another story. It would also help salaries -especially if the pass rate were a similar 29%. Not in the Philippines. Library leaders in the Philippines (just like those in the US) will say that we actually lack librarians, but this does not translate into higher salaries for those who do get licensed. If libraries were required to have licensed librarians to get state and federal funding (a policy some states now follow for library management) the licensed librarian : position ratio would improve; thus providing for better prepared librarians providing library service and improved salaries for licensed librarians. I think it is a wonderful idea (I hold licensure/certification from NY, NC, KY and IA already). I am afraid that many librarians will not find the idea as appealing as I even though there are provisions for librarians who have been practicing for years to be grandfathered. The system seems to be working well enough in terms of making sure that those who are not qualified will not be appointed to librarian positions, but due to the many problems that the Philippines has (see Are We Poor Because We're Catholic? ), I'd say that we still have a long way to go.